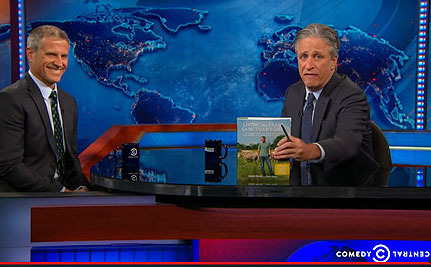 Have you seen the recent Daily Show segment about going vegan yet? On the show, Jon Stewart interviews author and animal activist Gene Baur about his new book, Living the Farm Sanctuary Life, the vegan and animal-friendly lifestyle guide. During the segment, Baur describes how vegetarianism and veganism can have enormous environmental and health impacts. Baur is the president of Farm Sanctuary, an organization that works to protect farm animals from cruelty, inspire change in the way society views and treats farm animals, and promote compassionate vegan living. Whether you identify as a vegetarian, vegan or meat eater, The Daily Show segment is entertaining, informative and, yes, funny! Jon Stewart has a unique knack for tastefully bringing light and humor to some seriously dark topics. 1. Health: We could save 70 percent of healthcare costs if we shifted to a plant-based, whole foods diet. 2. Water: We could save water–half of the water used in the U.S. is used to raise animals for food. 3. Climate change: Animal agriculture contributes more to climate change than the entire transportation industry. In 2009, a tiny one percent of the US population reported eating vegetarian or vegan. Now, 5% of the United States population is vegetarian and half of those people are vegan. The rates have skyrocketed over the last five years and studies show the rates are climbing. The fact that a mainstream program like The Daily Show had a full-length segment all about farm animal welfare and the benefits of going vegan shows just how far we’ve come as a society in recognizing the undeniable benefits of loving animals instead of eating them. There’s still a long way to go, but at least it’s a step in the right direction. Jon, if you’re reading this, here’s a suggestion: try this vegan recipe for corned beef, and let us know what you think! What did you think of the segment? Share your thoughts in the comments section, and if you’re already sold on living a vegan lifestyle, check out this list of rebuttals every vegan should know if you haven’t already. I hope people stop misunderstanding vegans as self-righteous or elitist -- veganism is the least exclusionary diet -- everyone is welcome -- everyone can afford it. It's good for everyone - if high-performing, elite male and female athletes can successfully be vegan, if babies can successfully be vegan (I know, I'm raising one), if breastfeeding moms can successfully be vegan, if people of all ages and any gender and any occupation, and living in any climate can be vegan, then EVERYONE can be vegan! Join the movement -- it is a happy, beautiful world if we are all vegan!